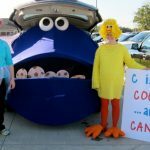 Share the love #7: You color my world, Valentine! - C.R.A.F.T. Share the love #7: You color my world, Valentine! If you’re new here, Share the Love, is a fun series happening every Wednesday and Friday until heart day all about clever, cheesy Valentines sayings! Wednesday we had another non candy Valentine day treat… Did you see the “You’re the apple of my eye!” treat idea? 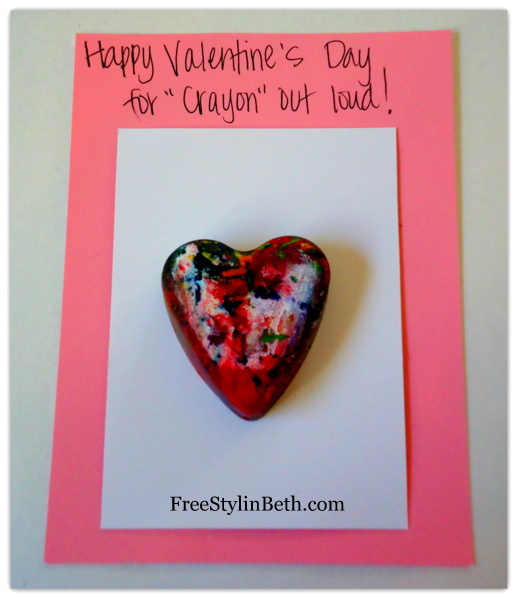 I love today’s Valentine involves kids being creative with crayons! Hello there C.R.A.F.T readers! 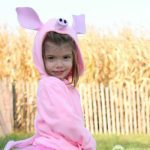 I’m Ashley from Cherished Bliss, and I am so excited to be here today sharing a fun (non-candy) little Valentine with you today! I have to be honest, I never really got that in to Valentine’s Day since it’s such a short holiday… with 3 small kids I can barely get dressed in the morning! 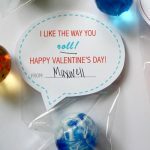 But my oldest is in school now and I’m his home room mom, so we had a lot of fun getting these ready for this year’s Valentine’s Day Party! These little crayon hearts are so fun and useful! Plus my kids had a blast helping me with the crayons! I mean what kid doesn’t love it when you say, “here break up this pile of crayons”, right? Although I’m sure this will come back to bite me later on when my kids randomly start breaking up all their crayons I guess I will take blame for that one! I also made these little printables to go with the crayons because Valentine’s is all about the cheesy sayings right?? To download the free printable “You Color My World” Valentines, just enter your name and email address below and the free file will be delivered to your inbox! The heart shaped crayon Valentines come 6 to a page. There is 1 sheet of pink Valentines and 1 sheet of aqua Valentines in the download. Now you just need to print out and cut your Valentine Cards. These are already sized to what you need for the 3″x4″ plastic bags, so just download from the link above and print it straight out as is. You can either use a paper cutter or scissors, it’s up to you. And have your crayon hearts ready to go! 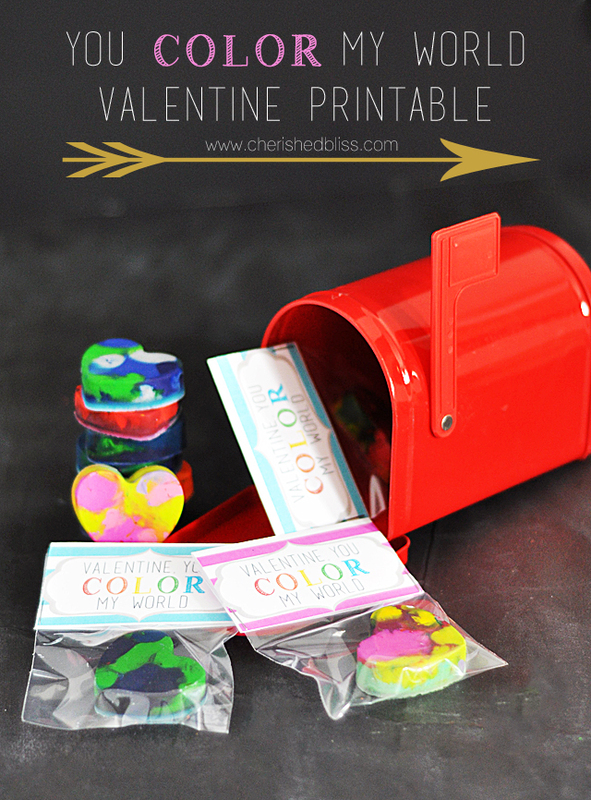 Next, put your crayon hearts into the treat bags, fold your printable in half, and staple over the top of your bag! If you want to get really fancy, you can score your card stock before folding it to make sure it’s a perfect fold. I have a tutorial on how to do that and it’s with things you have around your house! Now you have cute little handmade Valentine’s Cards that the kids are going to love!! 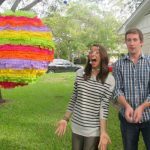 And if you are looking for some festive ways to bring Valentine’s into your Home, check out these great Decor ideas! It was so nice to be here today. I love meeting new people, so feel free to stop by! 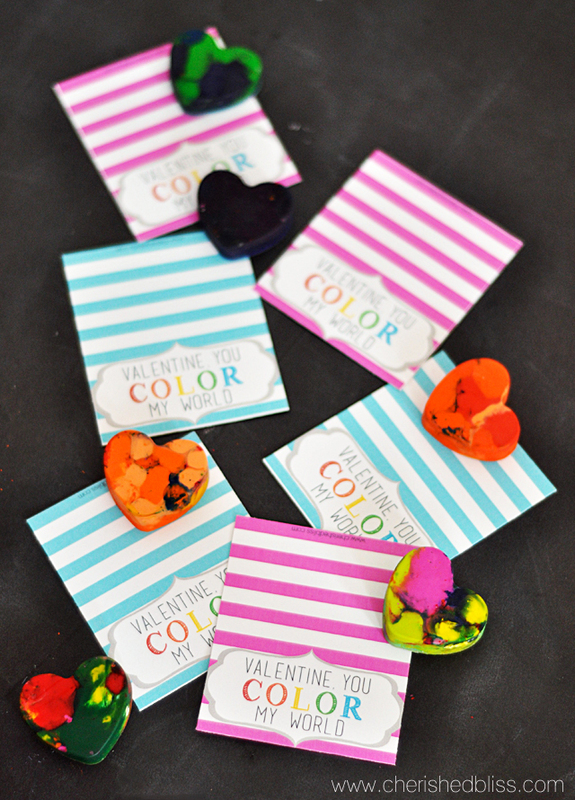 Psst… Here’s another fun way to use heart shaped crayons this Valentines Day! What a cute idea, thanks for sharing =) I can’t wait to do something like this for gifts when my little one gets a little older for Valentine’s Day card exchanges.